As I mentioned previously, The Kitchen Reader chose The Sugar Queen as the book selection for July. A few reviews already have mentioned the Grilled Tomato and Cheese sandwich described several times in the book, and I was inspired to create it. Using the description in the book, here is my take on Chloe's Grilled Tomato and Cheese Sandwich that the main character Josey enjoys so much. Ready for the recipe? 1. Heat a saute pan over medium-high heat. Spread a thin layer of butter on the bread slices. Add butter side down on the pan. Add the cheese to once slice of bread. If using, spread a thin layer of mayo on the other slice, then add the tomato slices. Season tomatoes lightly with salt and pepper. Let the bread grill until nicely browned and the cheese has melted. Combine the two slices, cut sandwich in half, and enjoy warm. It didn't take much to make me a follower :) I love a simple approach to cooking and will be trying out some of your recipes! Jo-Anna - Thanks! I will have to put more of her books on hold, I really enjoyed the first one I read. Thanks for the tip on the book, that hummingbird cake sounds delicious. That does look so cheesy and delicious - great photos! I'm always up for a grilled cheese. This is perfect timing because I'm just beginning to wade into heirloom tomato season. Soon, I'll be swimming in them, and then almost drowning in tomatoes in about two weeks. I'm so down with tomato on grilled cheese! Also, I keep getting the urge to spread a little fresh pesto on this too. Yum. Nice one, Ali. This sandwich really appealed to me and I found it the most powerful food scene in the book when Josey first watched Chloe make it. I love the dripping cheese in your photos! This looks delicious! There's nothing like fresh tomatoes from the garden in a sandwich like this! I'll have to give Colby Jack a try! I never used it in a grilled cheese sandwich. Thanks for linking up to Melt in Your Mouth Monday! oooh, that's my kind of sandwich! Looks absolutely fabulous and I'd love to try it one day! Look wonderful! We like something similar --- lunch meat, cheese, and tomato! Yummo! Thanks so much for sharing! I love tomato and cheddar sammies but had never thought of grilling them. Yummo! I'm your newest follower from the "Made with Love" hop & oh wow!!! My mouth is WATERING!! I just had breakfast & should want to 'pop a button' but all I want to do is try this recipe!! haha. Looks sooo good & I'm definitely going to try this! Thanks for the post! Stop by my blog if you get a chance. Its still new but I've got a great start. I can't even tell you the last time i had a grill cheese sandwich, it's about time i remedy that. I'm drooling. Thanks for sharing. This looks so good. A friend was telling me over the weekend about grilled cheese and tomato sandwiches. I've never had one, but I think that's going to change soon. This makes a great sandwich. I also like Grilled Cheese and Bacon. MMM looks delicious! I love tomatoes in my grilled cheese! 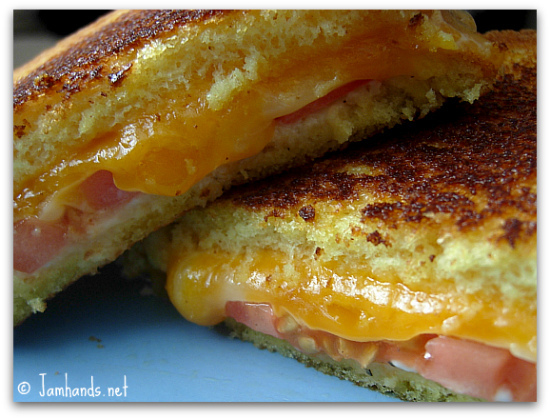 yummy, i love grilled cheese, i bet this would be good with onion and fresh spinach too! now i'm hungry! 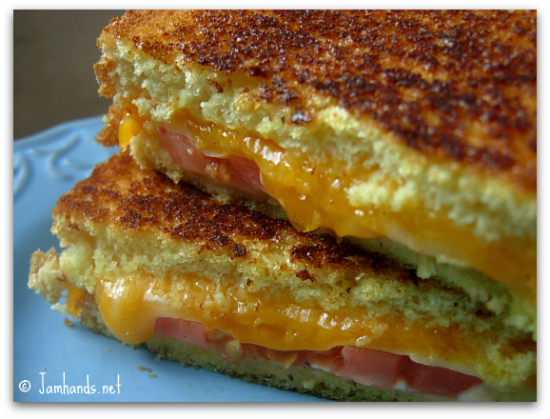 Grilled cheese and tomato is such a classic combo! Yum! Oh my, this looks delicious. I love tomato sandwiches. Yum! 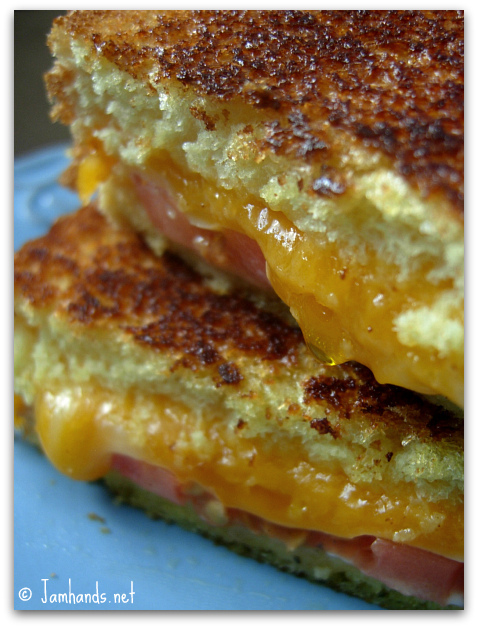 I love a good grilled cheese sandwich! Thanks for the recipe! This has got to be one of the best looking grilled cheese I've ever seen. Love the idea of making things from books! I love this sandwich with garden fresh tomatoes and sour dough bread, yum. Do you deliver?!? I wish I had this right now! As I write this comment it is noon time and I would like to reach through this screen and have your wonderful sandwich. It looks so delicious! Thank you so much for sharing with Full Plate Thursday and hope to see you again real soon. Hope you are having a great week! Oh yum! I'm definitely going to be making this soon and we are so glad you shared it with us last weekend at Inspiration Friday! Ali, those sandwiches look like the ultimate grilled cheese. I'm going to have to swing by my favorite little bakery tomorrow to get some bread to bring the recipe home! YUMMM!!! The hubbs would love that! !